When hip hop broke in the mid 70's Levis, not recognising the full cultural impact, chose to ignore it. The cost of the company's culture not being aligned with that of its audience is alleged to be somewhere in the region of $1 billion. US electronics store Best Buy stumped up $700 million for music retailer Musicland in 2001 failing to recognise that the teens with Best Buy Saturday jobs were using Kazaa and then Limewire to get their music. Best Buy ended up giving it away years later. The lesson here being that you have to spot shifts in culture as they happen and adapt your company's culture to fit. Listening to your audience isn't something that started when digital culture exploded, it's just been made easier thanks to the vapour trails of data left by people using digital products and the rise of analytic tools. Good analytic tools have become an essential part of the kit for trying to understand your audience - they are great at what they are made for - that being analysing data that will enable you to look for patterns. The problem is that they're deaf to culture and won't help you build an algorithm for curiosity. Spotting trends is different from understanding culture. If you don't understand the culture of your audience then you'll have problems slipping seamlessly into their lives. To understand an audience you must go beyond hearing a really start listening, a differentiation many struggle to grasp. Hearing is simply taking stuff in whereas listening is processing and knowing how to act on the information once you have it. I recently heard someone describe a good listener as someone who doesn't need to be given a christmas present list from their partner, they just know what to buy and why their partner wants it. There is a difference between knowing someone and knowing about someone. The question most people want answering is how do you listen to culture when there isn't an app for that? Paying attention to curators is a good starting point. I spent 15 years working at Radio 1, a network whose culture is perfectly matched with that of its audience. How do they achieve this? Easy. Management constantly surrounds itself with curators. The DJs are curators. Many of the networks producers are either DJs or club promoters. Some run their own music websites and many blog about their culture. There are curators at every level. The audience culture runs through every corridor and office in the building. In an information age curators are a great filter to help us make sense of culture. They enable serendipity, can find usefulness in useless knowledge and point us to the stuff we didn't know that we needed to know. They are not just aggregators. Over time they have built up a set of tools for unearthing the things that make life interesting and developed a tone that is both inviting an reassuring. These are skills not acquired easily or quickly. The rise of tools like Tumblr and Posterous are behind the much talked about 'rise of the curator', which has muddied the water a little. Having a Tumblr does not make one a curator. 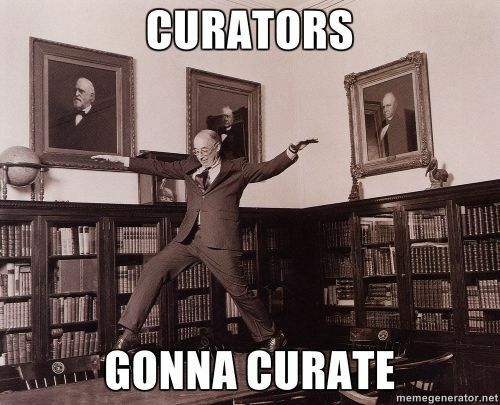 Pointing at new things does not make one a curator. Pick your creators wisely and recognise the difference between curators and those who label themselves coolhunters or trend forcasters. This is not a judgement, simply a differentiation. Curation is a skill that is journalistic and editorial, creating a frame around the content they share, adding depth and understanding. They add context and a point of view. So if you want to build a toolbox for listening to culture, which you really should, start by adding a few good curators. There's a level of creativity to real curation, that separates it from cool hunting. Nicolas Bourriaud is a great source on this.